This week’s numbers in the real world: License Plate numbers. This picture was taken at a restaurant In Jackson, WY that since has gone out of business. Not even a wall of license plates in the women’s restroom could keep people coming in to buy food and drink. License plate numbers are obviously important for giving each car a unique number-letter combination for easy identification by friend or foe. Hopefully, most of the people identifying your car via its license plates are friends. The origin of the license plate dates back to 1901. These early plates were the owner’s initials. Early license plates were made from wood, rubber and metal. State-made license plates first appeared in Massachusetts in 1903. Wyoming’s plate design first appeared in 1936 and is the oldest design still in use. In 1928, Idaho became the first state in the nation to feature a graphic on a license plate. A gigantic potato filled the entire license plate. How many different 7-place license plates are possible if the first 2 places are for letters and the other 5 for numbers? I’m not making this up people! That’s a lot of combinations! Oh, but what if no letter or number can be repeated in the combination? I’m not making this up either people! Gosh! This brings back fond memories of Statistics 101. If you want the formula for calculating these two answers, contact me. 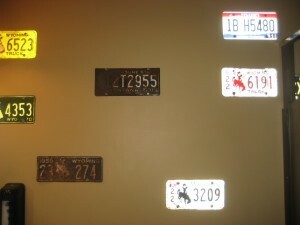 Here is a great site that shows each state’s license plate as of 2011. Whatever license plate you happen to be sporting on your vehicle, make this week count!